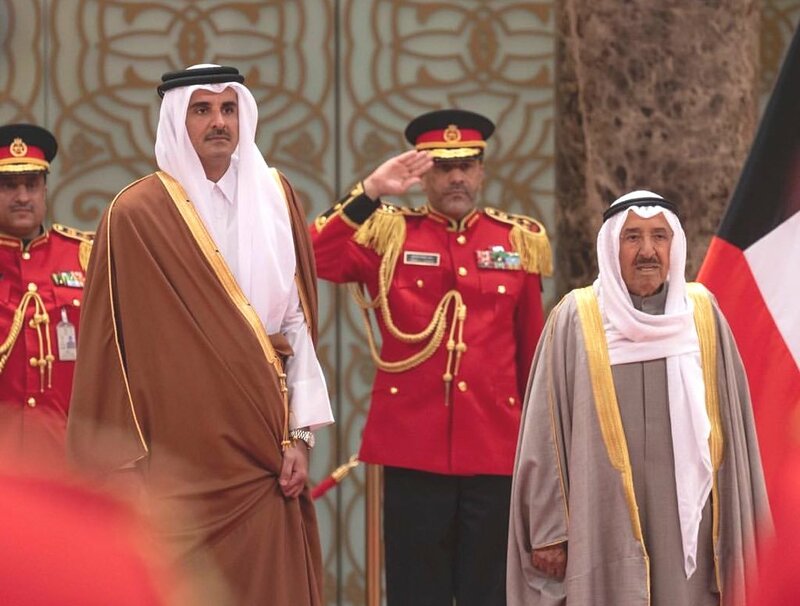 His Highness The Amir Sheikh Tamim Bin Hamad Al Thani arrived in Kuwait on a one-day visit earlier this afternoon. Upon arrival, HH The Amir was accorded a warm welcome by the Amir of Kuwait HH Sheikh Sabah Al Ahmad Al Jaber Al Sabah at the Kuwait International Airport. Also in attendance at the welcome were: Kuwait’s Crown Prince Sheikh Nawaf Al-Ahmad Al-Jaber Al-Sabah among several other dignitaries including Their Excellencies, senior military and civilian officials as well as Qatar's Ambassador to Kuwait Bandar Bin Mohammad Al Attiya, Kuwait's Ambassador to Qatar Hafeez Mohammed Al Ajmi and members of the Qatari Embassy, reported Gulf Times. As a gesture of goodwill, HH The Amir gifted Qatar’s national football team’s jersey to the Kuwaiti Amir, who signed another jersey for Qatar and wished the team greater success. The two leaders engaged in official discussions at the Bayan Palace focused on deepening bilateral relations. They further talked about ways to increase cooperation in areas of mutual interest and concern, according to Qatar News Agency. Qatar Deserve anything in this world..